Our Beyond Face Serum is the ultimate formula for the fight against the ravages of aging skin as well as the remains of acne breakouts gone by. This unique alternative to conventional cosmetic chemicals consists of 15 different essential oils, all combined together for one reason and one reason only: to be the absolute best solution for combating lines, wrinkles, acne scars and age spots. With 100% Paleo ingredients proven to improve circulation to the skin, Beyond Face Serum should be at the core of any healthy skin regiment to help improve circulation will deliver nutrients and antioxidants directly to the facial tissues. And remember--Beyond Face Serum was developed to work in conjunction with Beyond Face Moisturizer to maximize healing of damaged tissues. So go ahead—click the Add to Cart button now and get started towards a whole new, blemish-free you! Tamanu Oil: Research shows Tamanu Oil has an ability to heal damaged and scarred skin and has regenerative properties. The ability of Tamanu Oil to heal the skin surpasses that of most, if not all, modern day skin care products. Scientific studies show that Tamanu Oil is a significant healing agent because of its ability to produce new skin tissue and because of its anti-inflammatory, anti-neuralgic, antibiotic and antioxidant properties for younger skin. Tamanu Oil is amazingly effective for the treatment of acne and acne scars, scarring, eczema, herpes sores and the reduction or complete removal of unsightly age spots. Hazelnut Oil has a high content of essential fatty acids and deeply penetrates and stimulates the circulatory system. It helps to tone and tighten the skin, as well as aids in the regeneration of cells and strengthens capillaries. Argan Oil is naturally rich in antioxidants, which helps prevent cell oxidation and resulting ailments. Vitamin E is the primary antioxidant in pure Argan Oil, and it helps to keep oils in the skin naturally balanced by providing naturally oil-free moisture. At the same time, Vitamin E naturally decreases skin inflammation caused by acne. Argan Oil contains natural anti-inflammatory agents to reduce the appearance of blemishes. Acne sufferers can benefit from its sebum regulating abilities, which reduce oil production in skin. Argan Oil contains saponins, which helps to soften the skin and restore the skin’s water lipid layer, thereby minimizing wrinkles. Pumpkin Seed Oil is especially effective in combating fine lines, superficial dryness and prevents moisture loss. Pumpkin seed oil is nourishing for aging skin because of its high levels of fatty acids and its high concentration of protein, zinc and polyunsaturated fats as well as vitamins A, B, D and E.
Hemp Seed Oil is anti-inflammatory and anti-aging. It balances dry skin, helps heal skin lesions, contains anti-oxidants, and offers moisture-balancing properties. The oil is non-greasy and readily absorbs into the pores. It is an emollient, and has rejuvenating and moisturizing properties for the skin. Neem is beneficial for inflammatory conditions such as acne, dermatitis, eczema, psoriasis and wounds. A very effective antiseptic, anti-fungal, antibacterial and antiviral agent that is renowned for its cell regenerative, infection prevention and rapid healing properties. Hyssop properties include antiseptic, anti-inflammatory and astringent. Hyssop Oil helps slow the aging process, and helps to reduce fine lines and wrinkles. Bergamot is beneficial for treating wounds, eczema, psoriasis and acne. Antiseptic, antibiotic and cicatrisant (cell-regenerative for the skin and promotes healing through the formation of scars). Neroli is renowned for helping to reduce redness and irritation and is an effective essential oil in the treatment of both scars and mature skin. Neroli contains several natural chemicals, the most prominent being citral. This offers natural healing for dry, sensitive skin, and triggers the growth of new healthy skin cells. Not only does Neroli help fade scars, but it also regenerates new cells and improves the health of those already present. Neroli will refresh and smooth tired skin and repair broken capillaries as well as treat wrinkles and aging skin. Clary Sage is useful in the treatment of both mature skin and acne. It contains antioxidants that slow down aging and actually prevent wrinkles from developing. These antioxidants work against the free radicals that so commonly cause us to age. Both an antiseptic and an antibacterial, Clay Sage Oil aids in balancing sebum production, which helps to tighten pores. Closing open pores improves skin texture and tone. Firmer skin gives a smoother appearance, making facial wrinkles less noticeable. Orange (Sweet) is renowned for its regenerative properties in treating aging skin, as well as being beneficial for soothing skin that is dry, irritated or acne-prone. Rosewood is renowned for its antiseptic and cell regenerative properties. Beneficial for all skin types, especially for treating acne, dermatitis and skin that is sensitive, damaged or aging. Rosemary has antioxidant, anti-inflammatory, and antimicrobial properties, which make it effective against various types of infections, including acne. It has strong antiseptic and tonic action. Stimulates local blood circulation and cell renewal. Rosemary Oil helps eliminate scars, age spots, and smoothens wrinkles and folds. Carrot Seed is high in both vitamins and minerals and is considered to be one of the best oils to rejuvenate and regenerate skin tissue. It helps to remove toxic build-up in the skin, improving the skin’s complexion. It can also be used to soothe burns, blisters and scars, and is suitable for all skin types, especially dry and aging skin. Lavender soothes pain, prevents bacterial infection, aids in scar-free healing and has soothing, calming and restorative properties. Lavender is an effective oil which has a number of healing properties and is able to replace scars with a new layer of skin. Lavender is extremely beneficial for inflammatory conditions such as acne, dermatitis, eczema, psoriasis and wounds. Renowned for its cell regenerative properties, prevention of infection and promotion of rapid healing. To clean skin, apply one drop to each cheek, chin, and forehead. Gently massage into the skin. May be used under the eyes, but avoid direct contact with the eyes. SMILE. PLEASE NOTE: This serum does have a distinct scent due to the inclusion of Neem Oil. 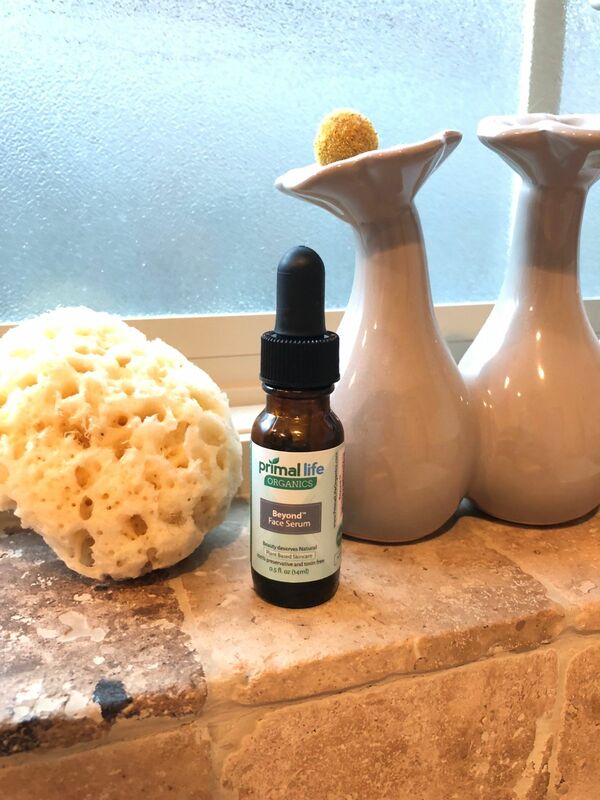 Neem Oil is an extremely effective ingredient in this formula and Primal Life Organics feels it is worth the "not so pleasant scent". Neem Oil is a very effective antiseptic, anti-fungal, antibacterial, antiviral agent and has been used for centuries in traditional Indian medicine to aid the healing of eczema, psoriasis, acne, rashes and burns. I love this. In a way, I miss the fragrance of some of my old products. However, I am trying to get rid of toxins so it is definitely worth the tradeoff. The scent is not offensive at all, it’s just not what I would choose. Finally found something to help heal this dry patches on my face. My skin is finally getting better. I am loving this product!! I have always had acne prone skin and tried a slew of products until I found a regimen that worked most of the time. After using the beyond face serum for three weeks, my skin is even and balanced, I've had little to no breakouts, and I don't have weird dry or oily spots. My skin feels healthy! I’ve been using this serum for a couple years and I can’t say enough good things about it. Great product! Great serum leaves my skin really soft. I am not crazy about the smell but my skin feels so soft it is worth it. I am hoping all the products in this line will also help me with my brown spots.